Hey guys! Those of you who follow me on Facebook probably already know that I'm in a Baking lab this quarter so there's gonna be baking-related posts for a bit! Are you excited?! Alright! Now this also means that we're going to be using scaled measurements here - I gotta do it in school, so might as well make it a habit of doing in real life! So bust out your digital scales! Hope you guys are doing well, we're just finalizing all the little details for the wedding (22 days!!) and staying busy - as always. So puff pastry. 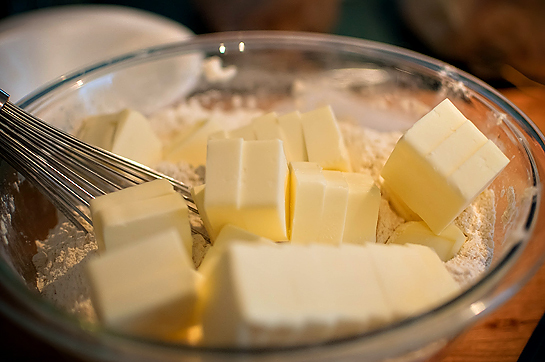 Tons of layers, tons of butter. But who has time to fold and turn, fold and turn, fold and turn?! That's where blitz puff pastry comes in. It doesn't quite rise as much as regular puff pastry, but it rises enough for presentation, and it's a whole lot quicker! Let's get to it! My digital's batteries went out when I started the recipe so I had to bust out my spring scale. Definitely not nearly as accurate as a digital or a balance scale - but you have to be resourceful with what you have! 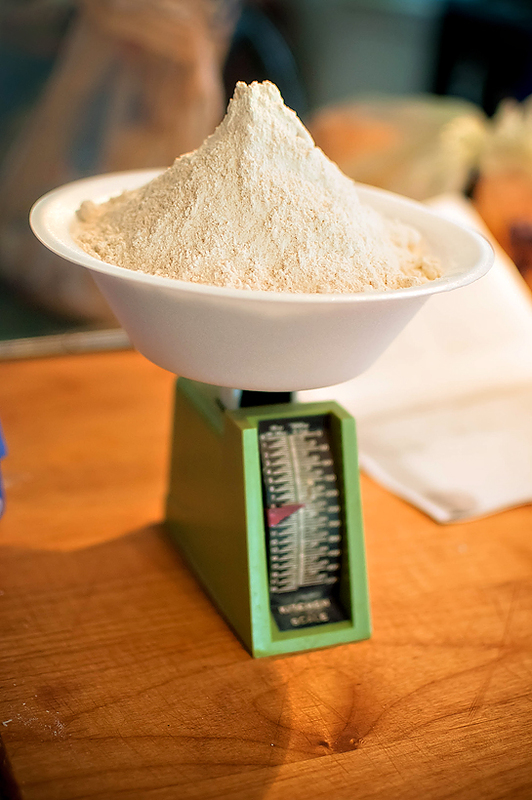 So now we sift our flours and salt together. 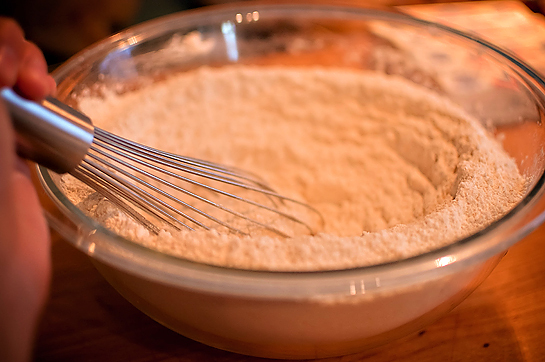 You could definitely use a mesh strainer or an actual drum sifter, but our chef said in a pinch, a whisk works just fine too. #2 - to incorporate air - this is the big one, ever notice that after you sift dry ingredients they seem to amount to more mass? It's the air! #3 - to create a homogenous mass - another big point. You want your individual ingredients to lose their sole identities to become one happy family. And now we're gonna cut in our butter. 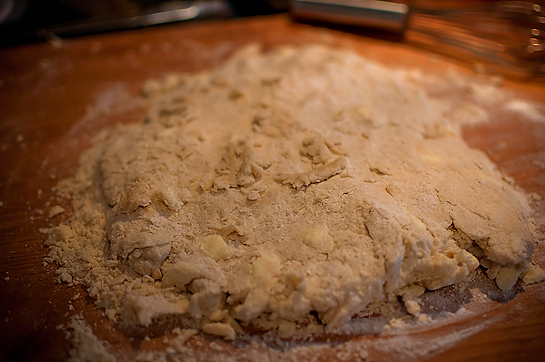 You want to "crush" the fat into the flour, not "squeeze" it in there. 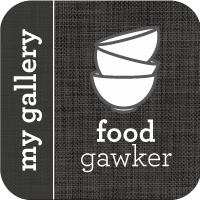 Picture yourself making the "I want money" gesture, not the "I want to choke the chicken". You know what I mean? Once you have the majority of the big chunks of butter incorporated into the flour, make a well in the center and pour in your cold water. 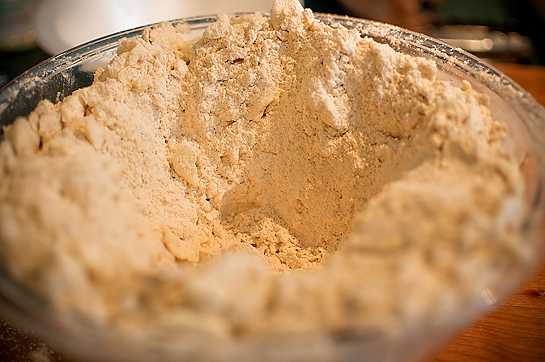 Use a bowl scraper or wooden spoon to incorporate the dough into the center until it forms a unified mass. Gentle now... we don't want to over work the dough. 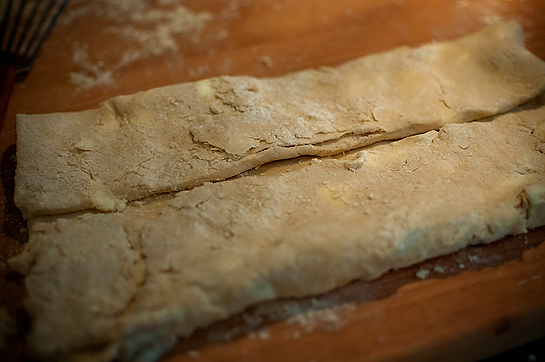 On a lightly floured surface, form the dough into a rectangle loaf. Roll dough into a rectangle that is about 1/4 to 1/8 inch thick. Fold the left and right sides toward the center, leaving a finger-width gap in between. Then fold the sides together. 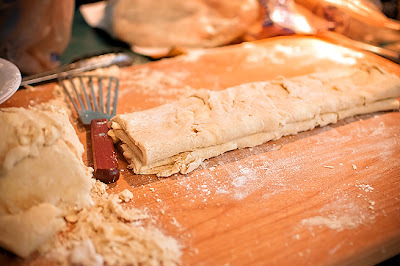 Then roll out into a rectangle about 1/4 to 1/8 thick again, and repeat entire process 2 more times. 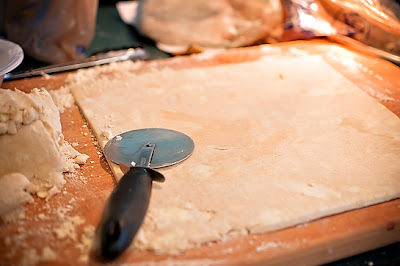 Wrap up your finished pastry and place in the freezer for at least 8 hours or overnight. And bam, you'll have puff pastry to use at your own discretion! Next couple of posts, I'll show you what I did with mine! Lookin good! that puff pastry is hard work :) Happy Easter Peggy! I really need to start weighing my ingredients. I love it when I feel like I am getting a work out when cooking. I made a quick puff pastry a little while back and Stella told me it was technically a blitz pastry. I loved making it and thought it was totally delish. I wish I were taking a baking lab. Sounds like fun! Wonderful!! Sometimes I really have a hard time finding good puff pastry!! I'm excited to see what you'll do with this! Sometimes I think the ready made ones rises too much. I need to roll it with some flour to stop the rising or put a heavier pan on top to prevent that. This makes a nice try for a home made version and used whenever needed. Looking forward to what you are making. Happy Easter! Never make puff pastry at home....you make very well!! Happy Easter! This should be fun; please share your recipes with us. Happy Easter! Great thanks for this. I made croissants three times but they are time consuming. We have people over for brunch a lot,and I am looking forward to what you did with yours so I can get ideas. Wow! I just took a course in puff pastry, and, of course, we learned the long way of doing it. I like your flash method and can't wait to see what you made with it. Amazing! I love this method, and I'm drooling just thinking about those flaky layers. Thank you for sharing. It was a great way to start my week. I hope you have a blessed day! Very informative! 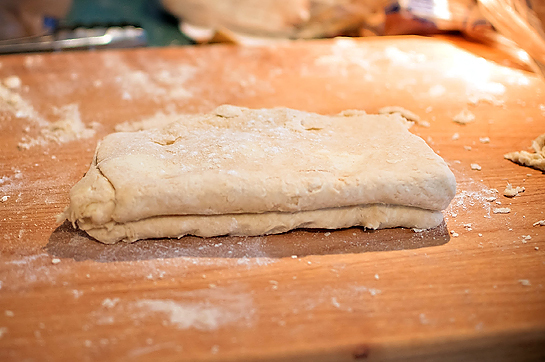 I've always been scared of making my own puff pastry, but this recipe doesn't look too bad. This pastry looks perfect! I'm always intimidated by making my own! Love this step by step post. Very interesting. Can't wait to hear abou tthe wedding!!! I make my own puff pastry but it takes forever. This is a great recipe. Can't wait to try it!